It’s not Sunday, November 1st, 2AM, 2015, yet, but if you’re a planner like me, twice a year the “Spring forward, fall back” represents a generationally revered semi-annual event, Fall Cleaning. Remember Spring Cleaning? As a child of the 50’s, I have memories of six Saturdays in a row devoted to landscaping, cleaning, organizing and collecting items for charity before the winter arrived. Now you can offer items you no longer use on EBAY or Craig’s List or recycle, up cycle, free cycle in one click (see links below) OR have a neighborhood yard sale. For those of you who have already lived most of your lifetime, and especially for myself after recently moving into the 150 SF Silver Bullet Tiny House on wheels, you probably have more “stuff” than most families. You may have to spend a few months of Sundays at local flea markets like Todd Farm or Brimfield, to get the “Fall Cleaning” ball rolling. This week you’ll have another opportunity to start another practice of the 6 R’s as we did in January, gathering items to re/up or free cycle as well as develop ideas from found objects for DIY holiday gifts, all at once! While we are tidying up the attic, washing windows, raking autumn leaves, replacing smoke alarm and carbon monoxide batteries, air filters, dusting, cleaning, caulking, weather sealing, turning over the garden and other items on the “Fall Cleaning” list (from www.lilblueboo.com) we can be collecting items from our closets, bookshelves, attics and garages to become repurposed holiday gifts for others over the coming weeks. My parents used to spend many full weekends with all of us kids (6 people) from Friday evening through to Sunday night). As I am alone with a new tiny house, my chores are a lot easier!. So I’ll be helping my daughter with her 750 SF tiny home 4 hours each weekend until we cap all the activities off with the Fall Back day on November 1st. All this fun and work results in future tax deductions for donating to others, extra cash, good karma, some fun and challenging DIY projects for the family. You save shopping time, and have a very clean house and garden for the holidays! With a great side benefit for you and your family of reducing your impact on the environment! Think how nice it will be to go skiing, snowboarding or another activity on Saturdays in December, instead of fighting the crowds at the outlet mall. • Have a neighborhood yard sale and give all or a portion of the proceeds to a local community project or non-profit organization. • Organize with 5 neighbors and friends some of the typical Fall chores, say your top five (prepping outdoor furniture, sweeping the garage, cleaning gutters, etc.) and arrange teams to do them at each of your houses over a few weeks. • Repurpose or Upcycle some of your “stuff” by making holiday gifts from items you found around the house, and perhaps engage your family members or friends to do the same. Giving baked goods or your canned organic garden treasures to friends is a great way to show them you care. Organize a cookie or canned good exchange party. • Shop local over the fall months at farmers markets, fabulous consignment and thrift stores as well as yard sales. Most people won’t know the difference between something bought new from a store and something gently used – and many will appreciate the recycled thought. • Perform a RAK, Random Act of Kindness, find a neighbor or local person in need and personally help them with a job or two of their “Fall cleaning”. Please send us your comments and feedback! Let me know your tips and tricks; especially if you try any of these! 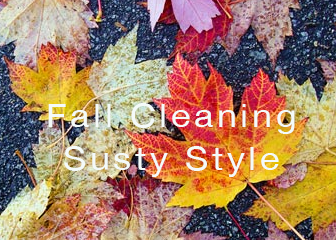 The “mother” of all Fall Cleaning Lists. • Bromine oxide (volcanoes), and bromine from manmade sources. According to the EPA, because of the risks posed by ozone depletion, leaders from many countries decided to craft a workable solution. Since 1987, 191 nations – almost every country in the world – have ratified a landmark environmental treaty, the Montreal Protocol on Substances that Deplete the Ozone Layer. 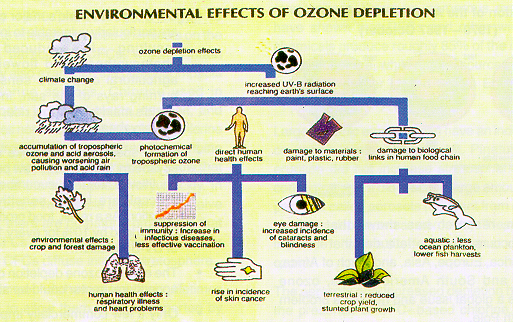 The Protocol’s chief aim is to reduce and eventually eliminate the production and use of man-made ozone depleting substances (ODS). By agreeing to the terms of the Montreal Protocol, signatory nations – including the United States – committed to take actions to protect the ozone layer, hoping in the long-term to reverse the damage that had been done by the use of ozone depleting substances. The ozone layer protects the Earth from the ultraviolet rays sent down by the sun. If the ozone layer continues its depletion by human action at the current rates, the effects on the planet could be catastrophic. The fact that the ozone layer was being depleted was discovered in the mid-1980s. The main cause of this is the release of CFCs, chlorofluorocarbons. Many CFCs have been widely used as refrigerants, propellants (in aerosol applications), and solvents. Antarctica was an early victim of ozone destruction. A massive hole in the ozone layer right above Antarctica now threatens not only that continent, but also many others that could be the victims of Antarctica’s melting icecaps. In the future, the ozone problem will have to be solved so that the protective layer can be conserved. The effects on human health range from skin cancer,cataracts, and other eye damage to immune suppression. The effects on plants and marine ecosystems disrupt developmental stages causing severe effects in reduced reproductive capacity and impaired photosynthesis to impaired larvae development. This week’s practice: minimize your impact on the ozone layer. Use low or no VOC (Volatile Organic Compounds) paints, sealants or adhesives next time you decorate your home or make arts and crafts. Travel via airplane less, decrease your GHG emissions. Grow a garden; plant some trees, bushes or flowers. Do not purchase products with CFC’s or HCFC’s; try to use products, which are labeled “Ozone-Friendly”. Ensure technicians repairing your refrigerator or air conditioner recover and recycle the old CFC’s so they are not released into the atmosphere. Vehicle air conditioning units should regularly be checked for leaks. Ask about converting your car to a substitute refrigerant if the AC system needs major repair. Help start a refrigerant recovery and recycling program in your area if none already exists. Suggest school activities to increase awareness of the problem and to initiate local action. Can we Make More Ozone? Yes. This holiday weekend I am grateful for weeks of my sustainable organic garden’s bountiful harvest. Working within the system of nature provided me with fresh vegan meals and flower bouquets daily. The Labor Day holiday vacation is upon us and our pantry and kitchen is full of preserved, frozen and awaiting vegetable bounty. I’ll enjoy filling and freezing homemade ravioli and canning a wall of fruits and vegetables* with the help of my daughter. I was reminded how substantial the rewards of an annual organic garden and a sustainable lifestyle can be. Although today I think I need a day of rest, to watch movies and relax. Back in the day we used to go to drive-in movies, a community event! Which reminds me of one other summer holiday vacation. Nine years ago, I began my journey towards a net zero lifestyle. Knowing I was heading for years of intense self-examination, education and research, I spent a month’s vacation at a glorious Yoga retreat in a beautiful mountain range with clear lakes, wild flowers, streams and charming small villages. Exercise, nature hikes, swimming and yoga 10 hours a day was so relaxing. I convinced the Director to allow me to skip out on an evening session to view what I referred to as “a documentary imperative to global awareness”. His mouth dropped open, he had no idea what I was talking about. I couldn’t wait to open the promo DVD in recycled cardboard of the first carbon neutral film produced with Nobel Peace Prize winner and environmental activist, Al Gore, in An Inconvenient Truth. As the film progressed I wept; I haven’t done that since my childhood when I cried at movies like The Bridge on the River Kwai, the Ten Commandments, and Gone with the Wind. The emotions expressed that day in 2006 inspired my own personal and sustainable Tipping Point. Two years ago I began building the off-grid, zero-waste Silver Bullet Tiny House and now I live in it. My story, the eBook, Living the Sustainable Tiny Life, was just released. Comprar, tirar, comprar, unmasks the reality of planned obsolescence. Food Inc., which will change your attitude about where you food comes from and how it is produced. The Cove, exposes the world of dolphinaria and dolphin practices around the world. Happy Feet 1 and Happy Feet 2, great films for the family to begin a conversation on the global effects of human activity on animal life. The 11th Hour, experts speak, backed with data, on the urgency of addressing the effects of global warming and climate change. Avatar, for its embedded bio-diversity and sustainability message. Plastic Planet, exposes the realities of consumption. *Such diverse concoctions as Hot Dill Spears, Regular Dill Rounds, Blackberry Framboise, Yellow Gold/Plum/Beefsteak Tomatoes, Chutney’s, Blueberry Basil Vinegar and Vera’s Fingerling Eggplant Camponata. And that brings me to this week’s practice: put up some lights, invite some neighbors and friends, share the organic food bounty and relax with an entertaining and thought provoking sustainable environmental movie from my Top Ten list or the list in the Deep Dive below.